Here’s another addition to the 5-Minute Sketching series. The earlier books were on architecture, people and landscapes. The format and presentation style is similar to the earlier books. It’s still a 128-page paperback. For every two pages, we get a topic with 5 tips and techniques with illustrated examples. The tips are brief but insightful. There are quick tips to give you ideas, techniques to help you experiment. I like the variety of art styles included. Just like the other books, this is a book that you can pick up anytime in the future for some inspiration. Gary Geraths is a great teacher and you can check out more of his work on his website. Note that there are two publishers for this book, Firefly Books and Search Press. The price of the Search Press edition is significantly cheaper on Book Depository. 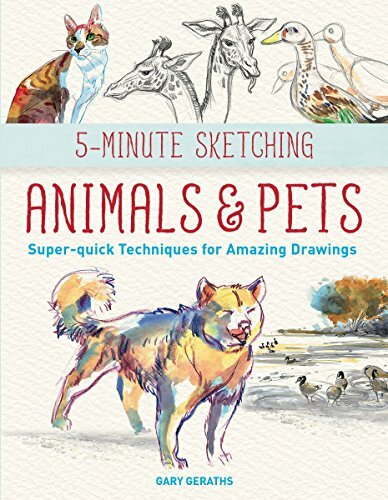 This is a wonderful book for those who love to draw animals.